Aberavon Sea Front. Aberavon seafront is one of Wales’ longest beaches having a contemporary promenade that overlooks Swansea Bay. It is popular whatever the weather. In the winter the promenade is full of wrapped up walkers, and in the summer, the beach attracts families who love the facilities on offer. The adventure golf, skate park, aqua splash play pool and the adventure playground mean that there is something for everyone to do. The peaceful sunken gardens are great if you are looking for something a little more tranquil. The beauty of Aberavon is that the beach is a vast expanse of sand, shoaling very gradually to sea making it safer for young children but nevertheless is also a surfing ‘hotspot’ and whatever month of the year, you are sure to find a crowd of surfers in search of the perfect wave! Bracelet Bay beach Mumbles. Just around Mumbles head and the first bay along the Gower is Bracelet Bay. There are rock pools to explore and the sand is exposed as the tide goes out. Caswell, Gower peninsula. Like all the Gower beaches, Caswell is blessed with good looks. The sand is fine and pale, and low, grassy-topped cliffs add a touch of drama. Just ten minutes’ drive from the village of Mumbles, this is a great place for little ones to learn about marine life, with plenty of rock pools to explore, while bigger kids test out the surf. Cefn Sidan, Carmarthenshire. Cefn Sidan is eight miles long,with safe water and easy access. Young nature detectives can climb the dunes to track down grasshoppers, beetles and other mini beasts in the Marram grass. The beach is part of Pembrey Country Park, which has play areas and an equestrian centre, dry ski slope and toboggan run. Langland Bay Gower peninsula. Langland, which is accessible to all, is one of the most popular beaches on the Gower Peninsula. The locals, who have been swimming, beachcombing and canoeing here for generations, were among the first in Britain to catch on to the American surfing craze in the 1950s and 1960s and the bay is still one of Wales’ top surfing spots. An all-terrain wheelchair can be reserved on 01792 635411. Oxwich Gower peninsula. Three Cliffs is Gower’s prettiest beach, but it’s a hefty walk carrying BBQ stuff. Neighbouring Oxwich is lovely in its own right, and has a car park, which makes life much easier. For the best experience, stock up on meat and fish at Swansea’s covered market, the largest in Wales. Pendine Sands Carmarthenshire. Pendine has something for everyone here: rocks pools and cliffs to the right, a seven-mile stretch of golden sand to the left, plenty of shops, and a public toilet, right on the seafront. These pancake-flat sands were once used for land speed records (visit the Pendine Museum of Speed for details) and cars are still allowed onto the beach at certain times, too. Rhossili Bay Gower peninsula. The three miles of sandy beach and the famous Worm’s Head sees Rhossili Bay often top the awards of best beaches in the UK and worldwide. Southerndown Dunraven Bay. The Glamorgan Heritage Coast’s best beach has its own car park and snack shop, together with everything a small person could want: huge pebbles, wide sands, and lots of rock pools. Southerndown is popular with surfers, and it’s just a short walk up to the clifftop ruins of Dunraven Castle, whose walled gardens have been restored. Three Cliffs Bay Gower peninsula. With its imperious three cliffs cut by the sea from 300 million-year-old carboniferous limestone, it comes complete with powder sand beaches, a medieval castle, salt marshes and a sparkling river. 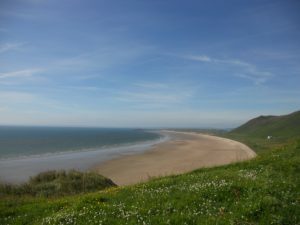 To compile my top 10 Beaches in South Wales required a deal of research, cold hard logic mixed with sentiment as there are no shortage of Beaches in South Wales.